Last autumn, we made a decision to start a new and exciting project in Uganda at the suggestion of one of our favorite people around… thank you Paul! One of these days, we are really going to have to invite him to talk to us at the Round Table. He really is an amazing guy. For decades now, I’ve watched as well-intentioned people trek off to Africa giving donations of things they deem important or helpful. The intention is definitely right; but the actions are often misguided and uninformed; thus rarely truly helpful in the long run. So, each year, we ask our cooperatives to tell us what we can do to make their lives easier, what projects they are working on, etc. And at the end of 2014, we heard something that we got really enthusiastic about: solar power for our cooperative members’ homes. We’ve always known that fair and ethical trade should be tied to much more than just fair prices and working conditions. It is about a sustainable lifestyle for us and most issues are linked. We have always understood that the way we do business might not always make sense to a “numbers guy”; but it will always resonate with someone with lots of heart. And, this is one project which did just that: it touched our hearts. Maybe donating part of our proceeds to projects like this one reduces our “bottom line”; but for us the real “bottom line” is treating people ethically and making the world just a little bit better. We’ve done so since day one and we’ll do it long into the future, with your continued support. Light Up Their Futures, the first round of lights are delivered and photos have arrived!! 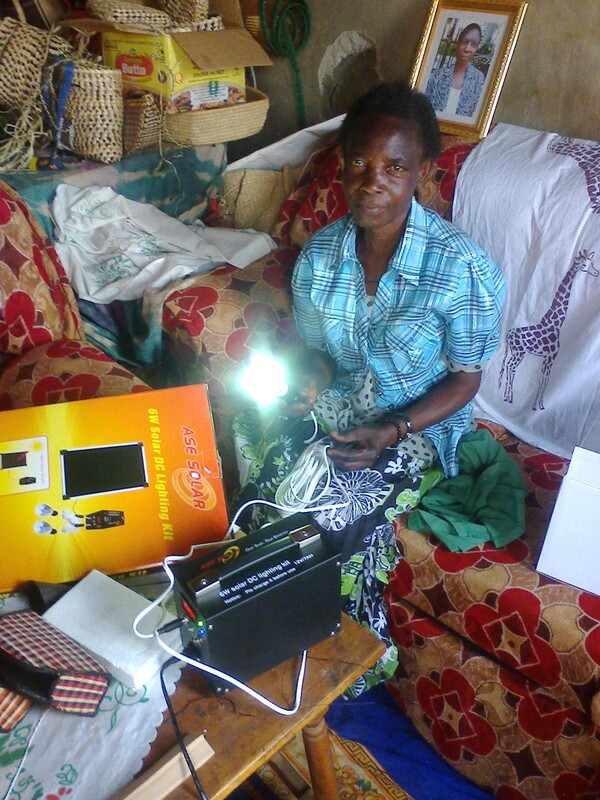 Soon, we will be posting an interview with Ms. Prosy Nabwami, detailing her experience with her new solar kit and how it is already improving her life and the lives of others in her community. We expected, due to our years of experience working with African women and their families, that there would be some extended benefits for the communities we sent the kits to; but wow! As we have known for a long time, each woman (and some men) tends to support more than just their immediate family. Generally speaking, every African breadwinner supports an average of 10 people. Those who have share, it’s a simple as that. But, we had no idea that the positive effects of a single solar kit would reach quite so many people. Here is a quick overview of our project and we are really hoping that you will join us with a small donation to help us continue to Light Up Their Futures! Solar kit initial cost: $120. Reoccurring costs per kit: ($5.50 for replacement bulbs (bulbs last for approximately 8-12 months) and 35 cents for replacement batteries (lasting 3-5 years each). We have invested in high quality solar kits which are expected to last 20-25 years. • Over a dozen people directly gaining from use of each kit. For those of you who are interested, you can either donate the $120 for a kit or you can give a portion of the cost, which will then be added to the funds given by other donors. Hey, if those women can work so well together, why can’t we, right? You could get together with a dozen friends and each donate just $10. Your group of 12 people will, in essence, allow 12 Ugandan women to weave a better future for their kids who are studying by the very light you donated. Beautiful, right? We will continue to use part of the proceeds from all online sales to fund our Light Up Their Futures! campaign. And, if you want to really help out in an even bigger way, buy a product that is made in Uganda over at our site. This is an amazing way to help us sell the baskets being woven by the very women that you are proving light to. You’ll be giving twice! For every Ugandan basket ordered in 2015, Mama pledges to ensure that the usual donation we set aside goes directly to our Light Up Their Futures! campaign. If your coworkers, classmates, friends or church want to make a larger donation or sponsor a few kits; please do so here, or contact Mama directly. Blessings to you and yours. May your life be filled with… light! Just another delicious way to support fair trade: French style macarons made with our Omanhene cocao powder and filled with a chocolate ganache made with our 80% dark chocolate… ethical trade never tasted so good! The Full recipe can be found over at Mama Europa’s blog. So, here we are, facing the end of the world (again). What to do? I will avoid the jokes about those who have stockpiled food, joined cults who convinced them that they were the only way to avoid sudden death, or those who hiked to far off mountain tops in France or Peru hoping to meet aliens who would sweep them off to a planet where all would be well… After all, I’m sure there are lots of people who have dedicated their entire day to making others laugh with punch lines they’ve worked long and hard on. Luckily, the Mayans were right on one count: the world didn’t end today (—yes, most people miscalculated). I am hoping though that instead of worrying ourselves silly about what the exact date is for the end of time; we will instead focus on what matters: HOW we are living each of those days that we wake up and have opportunity. Look, none of us know when the world is going to end. But, I suspect we’ll have a little better clue than a pretty, round calendar which even the Mayan people says doesn’t mean the end of the world; but the end of an era. To be honest though, even as a Christian woman, I hope that the Mayan prediction is right. I hope this will be a new era. One in which we think of others before we think of ourselves. One in which we think about the impact of our actions and choices before we decide even the simple things. I hope that we have used this opportunity to think about the fact that anyone can die at any time. For some, it is a tragic accident or disease that no one can cure. But for others, it is ultimately poverty that causes their death. Whether they cannot afford to eat healthy food, have access to clean water or pay for medications which would be readily available (and sometimes free) if they lived in another part of the world. Some will die because they had the misfortune of being born a girl in a land where women aren’t respected. Others will be killed for their religious beliefs, their desire to speak the truth or because they hold hands or kiss someone before they are married. And yes, many will be killed before they are born because they have the misfortune of being a girl child in a nation or culture which has a preference for boys. Still others will live, only to be denied the most basic of human rights. Well, today you and I are given an opportunity, as we have been given every day thus far: We have the opportunity to make this day matter. Whether by a gesture, a donation, or just the way that we choose what gift to offer to a friend, what food to feed our own children or what words we speak… we have a great opportunity to become the “New era” that people are talking about in the Mayan culture. Ultimately you see, we are all people and we could all use a new era: One in which we put others before ourselves. Not in that awkward “New Age” mumbo jumbo kind of way which implies we all have to dress like hippies or risk being called hate mongers. But, rather in a concrete manner which creates, choice by choice, word by word, a new lifestyle. One where we enjoy life every day and work toward helping others enjoy their lives too. I’m going to spend today like I spend most of my days: Living like I were dying… and like I am able to prevent someone else from dying through my choices. I’m dropping off a couple of Christmas gifts to friends that are gift baskets full of organic and fair trade items that they can enjoy with their families. I’ll touch base with the cooperatives that I work with and see if I can be of service to them today. I’ll talk to a lady I know who is having a tough time this holiday season because she is alone. I’ll drink another cup of fair trade coffee from Zimbabwe and pray for the farmer’s hands who picked the beans. I’ll connect with friends on Twitter and Facebook and I’ll thank God that I’m here another day to do it all. Then, tonight, I’ll hug my family members and tell them how grateful I am for their love and support. Then, if the sky really is falling: I won’t care. Because worse than death, is regret. And I won’t have any of that to freak me out. I’m really far from perfect; but I’m trying to live a life based in love for others and appreciation for what blessings I have. If you are celebrating Christmas soon, I wish you a very merry Christmas. If you are instead Jewish, Hindu, Buddhist, Atheist or of another faith… I wish you the very brightest and best New Year to come. And I sure am happy to know that we have the opportunity to build a new era together. I am sure we can do it, one kind gesture, one loving word and one responsible decision at a time. Now that you’ve had your fill of turkey, watched the Macy’s Thanksgiving Day parade and laughed at the dinner table with family and friends… its time to head over to Mama’s After-Thanksgiving sale. It’s true, working through that list of gifts to buy can be stressful for a lot of people and it isn’t always easy to do it while living on a budget. So, why not take a break from it all, sip some of our delicious Red Bush Tea and listen to your favorite music while browsing through the many items we have discounted (some up to 50%!) You’ll get to avoid the crowds at the shopping mall AND you’ll be helping some great African women feed their families this holiday season. Whether you’re getting gifts for Hanukkah, Christmas presents or putting a few things away for Kwanza… you can keep the true spirit of the holiday season because you’ll be giving gifts that give twice: Once to the person you offer them to, and again to the women who make them. Hey wait, I almost forgot! You’ll also be giving a built-in donation to our fabulous friends in Rwanda too! Wow, 3 gifts in 1… who wouldn’t love that?! A portion of all sales from November and December will go to assist our friends in Rwanda who are working to expand the number of women and families that they serve by adding over 500+ women to the already hundreds of women and orphans that they assist! Although it was initially started to help genocide survivors (primarily women and children) to receive trauma counseling, job training and other forms of direct assistance; they now also help those with or (caring for those with) HIV-AIDS. As you may know, women are most greatly affected in the HIV epidemic as they are the caretakers in a family. Mbwira Ndumva is now working on completely renovating a small building so that they can offer additional job training, counseling and other services to those suffering from or caring for family members with HIV. So, this holiday season, we respectfully ask that you remember those who really need you: the women of Rwanda. You’ll be able to offer a great gift such as our African coffees, chocolates or a beautiful basket PLUS you’ll help a woman in need to provide a better life for herself and her family. And let’s face it, there really is nothing that feels better than knowing you stepped up to help a woman who is working hard to help herself. Mama is convinced that sustainable development like this job training program which will lead to more ethical trade in Africa is the only way to permanently alleviate poverty in Africa and to help African children have a better future. Join us in saying “We love you.” through your order or donation. We won’t end poverty this year; but we sure can work to alleviate it… one order at a time! Our friends at Mbwira Ndumva thank you and so do I.
Resilient Rwandan Women Inspire Me! It has been a little over 10 years since I first heard from Béatrice of Mbwira Ndumva in Kigali, Rwanda. 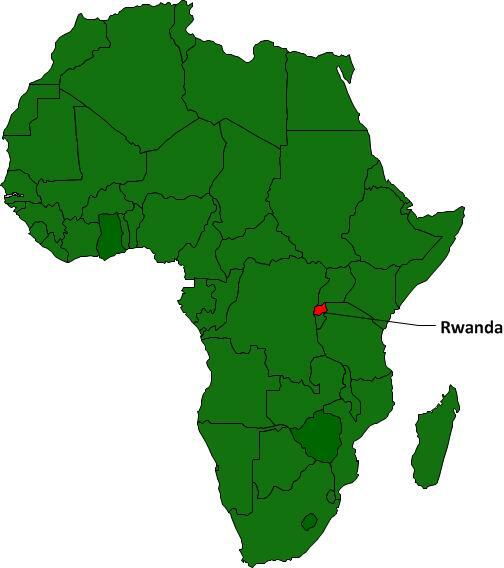 I, like many of you, had seen the horrific and saddening images of Rwanda during the genocide in 1994. Like most people, I wondered how life could ever return to normal for those who survived such large-scale devastation. 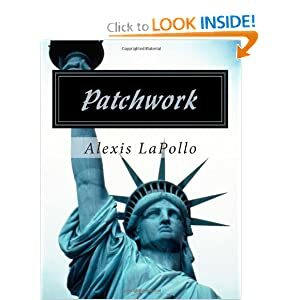 Many of us also asked how in the world those who were lucky enough to survive would be able to find the courage to go on, much less to rebuild a nation. But one thing is true of the Rwandan people: they did not lose hope! They almost immediately began working to move forward and build new lives. Mothers who lost their children in the genocide decided to become caretakers to orphans who lost their parents in the same tragic way. Sisters, aunts and grandmothers began taking in their young relatives. Many others showed an act of love by doing the same selfless gesture with strangers’ children. The already poor offered to make even greater sacrifices to welcome those who were in need. For over 10 years now, the Mbwira Ndumva Initiative has been working with women day in and day out to: teach them marketable skills, help them heal both physically and psychologically, and to find the hope and the means to start rebuilding the social fabric which was torn apart during the months of mayhem and killing: the family. The women who make up the initiative are loving and hard-working women who are doing their best to ensure a better future for Rwanda’s women and children. As the years went by, they offered hope to women and children who had lost everything. Eventually, they implemented a program (now suspended due to a lack of donors), which provided microloans to women for a period of one year. This $25 allowed beneficiaries to start new lives for themselves through training and the purchase of the necessary items to start their own businesses. Mama Afrika joins Mbwira Ndumva in praying that it is able to be launched again someday soon. When Mama first started buying cards and donating funds to this incredible organization, their focus was on women and orphans of the 1994 genocide. Today, in addition to the 700 members that they work to support; there are now an additional 500 women with HIV or AIDS, over 40 young orphan girls and 40 very poor children who also depend on this organization for things such as education, professional training and counseling. They would love your help in caring for some of Rwanda’s women and children. Your donation to their efforts will allow them to continue to serve the greatest number of people possible. And you can feel good about purchases made at MamaAfrika.com because Mama is going to stay with this great group of women until there are no more Rwandan women and children in need. We look forward to the day when the word “Rwanda” makes people think of prosperity, peace and an example of how empowered women make all of the difference between poverty and prosperity. In all honesty, I can imagine that day clearly and I’m sure that with your help; we’ll get there. 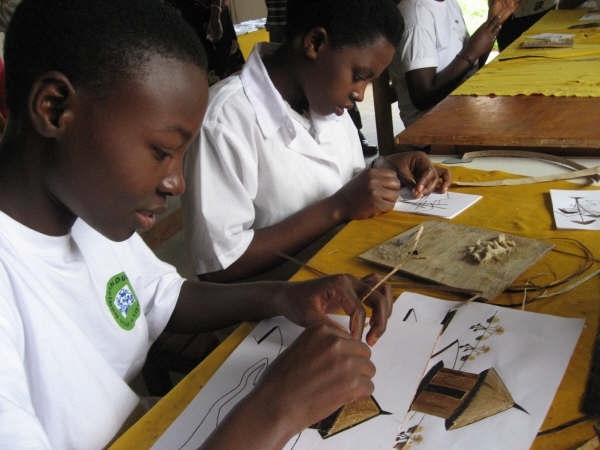 After all, the Rwandan women we know are such hard working, creative women that with a little help… it’s inevitable! If you make a monetary donation, you can select Mbwira Ndumva and Mama will get 100% of your donation to them so that they can continue the incredible work that they are doing! We sell their Christmas cards Now, we hope that, with your help, we’ll have a “Sold Out” soon! Coffee is one of my favorite indulgences. I begin every morning with my coffee ritual and I know full well that I’m not alone. Many of you also look forward to that cup of coffee that starts your day. I’m using a conservative estimate of $4 per cup of latté or other gourmet coffee (many run more than $4). At that price though, your daily cup costs you $1460 per year! Once you have caught your breath, join me for the rest of my math homework… don’t worry, the rest is so much easier to swallow! At the end of the day, your coffee cost stays the same annually and you only have to “invest” in the grinder, coffee maker and hand-held frother once. Is it great to save so much money? Of course it is! But, money isn’t everything is it? Sure, it’s great that it only takes about 10 minutes a day (less than the time it takes to wait in line for your coffee). The best part of it all is: FLAVOR!! You will wonder why you waited so long. Most companies have huge mark-ups on coffee and farmers see very little of the price that you pay. But, since all of our coffees are fair trade, you’ll have the bonus of knowing that you are supporting farmers who are being paid a fair price for their beans. Additionally, you’ll be helping African women and children through the donations that are made to the organizations we work with (a portion of all sales on MamaAfrika.com). High quality fresh-roasted coffees (mailed only days after roasting!). Fair trade (and your built-in donation) means helping the poor live better lives. Today is All Saints Day, a day to celebrate all of those saints, both known and unknown. Regardless of whether you are celebrating the holiday today or not though; there is certainly something to be learned from it. You see, saints are those who have shown the way. They are ordinary people who came into the world in the same way that you or I did. Some were born rich, others poor. Some were particularly gifted; others had great physical deformities which made their lives particularly difficult. But, all of them have one thing I common: they overcame obstacles while walking the on the high road. You see, it isn’t some angel that comes down from heaven and makes you a saint by decree. These people were just that: people. What makes us different in the end? It certainly isn’t our potential because we all have that. I’d argue that it’s our choices. Let’s face it, it isn’t easy to act with patience or kindness when the person we have facing us is particularly difficult, crass or disrespectful. We know the “right thing to do”; but we tend to be focused on our own goals, our own pride, our own needs and those daily struggles which seem to sometimes remove our ability to see the much greater picture. It is part of being human after all. Let me be very clear: I am not writing this in an attempt to convert you to a different religion or to burden you with guilt. What I want you to know though is that the reason that saints are so wonderfully important to me is that they show me what can be done… because they have done it. Superheroes in their capes are great fun. But because they are fictional characters, they are only that: fun. We can dress up to look like them; but it doesn’t make us able to fly or shoot spider webs from our hands. Saints though have done those things that we strive to do and they’ve done it under the harshest of circumstances. The one thing they all have in common is that they didn’t let go of their belief of what is right. So, whether you believe in literal saints or not and regardless of how or to whom you pray; isn’t this something that we can all agree on: Miracles are possible and regular people are the tools that make it happen. Many of you have worked to improve the lives of others, some of whom you will never meet. To those people, you were saints. Perhaps you (like me!) wouldn’t want people to know all of the errors you’ve committed in life. You might not want to have your mistakes printed in the local newspaper. The thing is that is why you are human. I know I’d never come close to passing even the most rudimentary stages of the scrutiny involved in attaining sainthood! But, I can say that I look to the perfect example of how to be and it inspires me to know that even I can be a concrete tool for the creation of good things in the life of someone else. When I imagine myself throwing a dinner party for a group of saints, I think of whom I’d like to have next to me for interesting dinner conversation and many of you would be invited. Among my guest list would be a few friends like Geoff, Nigel, Kathleen, Tomas, Ida, Paul, Dominic, Freweini… Hmm, now that I think about it: It would have to be a really large dinner table! There are hundreds of people whose paths have crossed mine over the years who have made me strive to work harder, smarter and more faithfully to improve the lives of African women and children. There are those who simply stopped to encourage me along my own journey. Many others skipped one of life’s little pleasures in order to make a small donation to our cause. I’ve met women who decided to offer their own child one less gift for their birthday or at Hanukkah or Christmas in order to donate so that one of our coop members could see her child receive a present or school supplies. We have received orders for multiple gift baskets with a note that says that someone is committing to only offering fair and ethically traded gifts to their friends and family. Some businesses decide to throw an office party using our larger gift baskets instead of offering small individual gifts to their employees. Then there are those who pray for our women, fundraise for them or invite me to come speak so that we can spread the word about concrete and efficient ways to help. Every single person who acts is a piece of the puzzle. Every individual is a saint to us. Happy All Saints Day everyone and thanks so much for each act, each purchase and each voice… we’d be nowhere without them! Its Our 10 Year Anniversary! Where does the time go? Despite spending the past few months getting ready for our 10th anniversary celebration; I still can’t seem to believe that I’ve been doing this for 10 years already! It sounds completely cliché I’m sure; but it is still true: It feels like yesterday that I got my first sample of baskets in the mail from Africa! 10 years… it’s crazy! So, where has the time gone? Well, over the years, we’ve managed to rebuild houses, invest in tree planting, pay for the training of new cooperative members, send eyeglasses, school supplies and textbooks to countries across the continent. We’ve made donations to the elderly, the sick and to many schools. We have added new product categories and made so very many new friends. I’ve been invited to speak and teach in local schools, international festivals and to groups like the Rotary Club. I’ve hugged cooperative members and dear friends like Paul from Uganda, Elizabeth from South Africa and been blessed with the cheerful attitude of now world-renowned artist Janet Akii-Bua of Uganda. Over the years, I have answered questions such as “What is a dictator?” and yes, even offered help to the occasional German, Canadian or American high school or college student when they were stumped on their homework. I’ve listened to people’s excitement about their recent trip to Africa and heard tales of a passing conversation about an issue related to African women. I’ve sold our products online, in a shop, at a booth on a military base, and yes once even from the trunk of my car (desperate times call for desperate measures… and this lady was desperate for a gift!). We’ve increased our product lines and the number of countries we trade with. We’ve sold hundreds of baskets, pounds of chocolate, dozens and dozens of carvings and you know what? We are just getting started! I’ve learned many lessons, made many great connections and even more dear friends. Yes, 10 years seems like such a long time… but I’m in this for the long haul. One woman at a time, one product at a time… we are going to relieve poverty and increase opportunity for African families. Join me and our cooperatives for another 10 years of smiles, great African art, coffees, teas and chocolates. I promise you that you haven’t seen anything yet! We’re just getting warmed up! Remember we can help African women live better lives: one sale at a time! ** This post was originally written for MamaAfrika.com ‘s Grand Re-Opening. Be sure to stop by and see what else is new on the site! I can’t say that I am a bonafide “foodie”; but I am sure you’ve noticed that I do love talking about, thinking about and cooking food! Coming from a multi-cultural home where we moved more often than the average family; I learned at a young age how much food is tied to culture. The things we eat, the things we refuse to eat, the way we cook, barbecue or roast… all tell us something about who we are as a people. You are welcome to include a recipe that comes from any country at all. What is most important is that you share the basics: How (do you make it) Why (do you love it). You’ve got a little over a week to prep so… ready, set go! ** Just make sure to link back to this blog post and include a comment here on the blog to let us know where you’ve posted your recipe! All entries submitted on or before April 1st will be counted. Again, please make sure you leave a comment here with a link so we can find it!